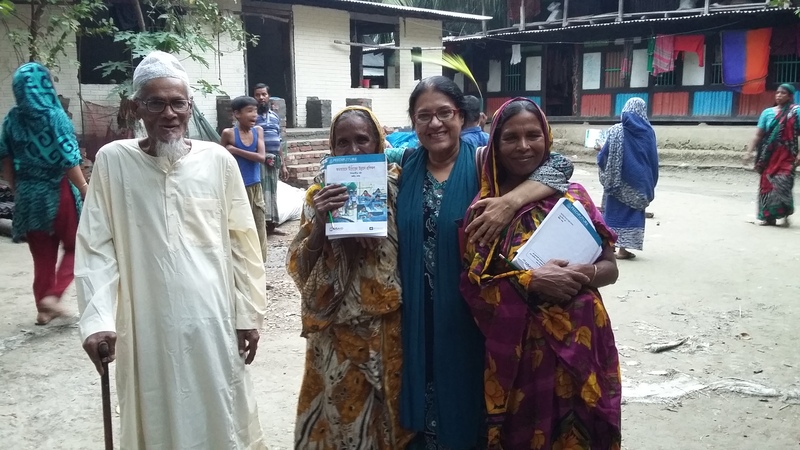 Rokeya (third from the left) has conducted many trainings related to climate change and disaster risk reduction for communities in Bangladesh. Rokeya Khatun comes from Barisal district, which is located near the Bay-of-Bengal. She used to move from one sub-district to another when she was a kid. Back in 1965 while she was in her junior high school, she experienced a terrible cyclone where the water level in her sub-district rose up to the height of the electric poles. “We had no idea about how high the water level and speed of the wind could be. My parents put reading table on the bed and put us on the table. We could take shelter in school building if we’d had a minimum understanding that the tin roof can fly way, the water can be as high as 7 meters.” Rokeya told us. At least 19,279 people were killed in that cyclone as it hit the coastal areas. Out of the casualties, 16,456 were in Barisal. The cyclone hit with a wind speed of about 160 km per hour associated with a storm surge of 3.7 - 7.6 meters. “That cyclone totally destroyed our tin roof and the tin wall in one one room our house. If we had been a minute later, the entire family would have been killed,” she added. Since then, Rokeya has been involved in developing tools for mainstreaming gender in Bangladesh’s national/city planning and project implementation. “Frankly speaking, my work related field based experiences and learning through frank communication with the rural communities ignited the motivation to work for women’s empowerment and gender.” She said. She developed policy leadership and advocacy for gender equality, mainstreaming gender into thematic areas (e.g. disaster management, climate change issues, urbanization and settlements, and food security). She also works on advocating disaster risk reduction issues through her project: ‘Reducing Vulnerability of Women Affected by Climate Change through Alternative Livelihood Options’ in which she assessed climate vulnerability of women, children, elderly and physically challenged persons living in southwest region of Bangladesh. These areas have been affected by droughts and riverbank erosion as well as other climate change impacts such as storms and severe cold waves during winter. “River bank erosion affects women differently than men, there’s high chance of losing her only source of income, such as a vegetable garden.” Rokeya then added, “Loss of home led to physical insecurity for herself and her adolescent girl. The disaster will stop the girl going to school, because she needs to help with her mother’s work at home and outside.” She explained how women are amongst the most vulnerable when disasters occur. Rokeya said that there’s a common migration pattern that happens after disasters occur in Bangladesh. Male members of the family search for employment and this causes them to give up their family responsibility entirely. In most cases, husbands don’t come back and also in most cases husbands don’t send their earnings to their wives. There are lots of initiatives that have been taken to reduce the vulnerability of women and adopt their viable livelihood options in last few decades in Bangladesh. The government agencies need to be strongly motivated to apply a participatory approach in feasibility studies, project design, implementation, monitoring and evaluation of sub-projects, and to continue to involve woman into the process. However; the gender issue itself is a cultural phenomenon and if we want to see through a gender lens, it’s not very easy to understand the changes as well as the role of women in climate change issues.